PoE vs. PoE+: What is the Best Switch to Meet your Network Needs? If you’re new to networking, you might be wondering what in the world is the difference between PoE and PoE+ switches. And, why should I care? With numerous variations of series, port counts, sizes, and types of switches out there, it’s challenging for the non-technical elite to make sense of it all. So, we’ve rounded up some knowledge and insights to help you understand what a PoE switch is and how it’s different than the plus version. By the time you finish this post, you’ll be mentally sparring with the best CTO’s out there. Power-over-Ethernet, often referred to as PoE, is a system used to distribute data and power to a targeted network of devices via safe Ethernet cabling. It uses basic copper cables and a switch to send power to the network. Recently, PoE+ has also become popular. Use this guide to help you determine which one best meets your needs. If you love to see Jonathan’s shiny forehead, we’ve got a lovely video of him communicating a few tidbits about PoE in this video about our WS-C2960X-48FPS-L 48-port switch. [Read more…] about PoE vs. PoE+: What is the Best Switch to Meet your Network Needs? 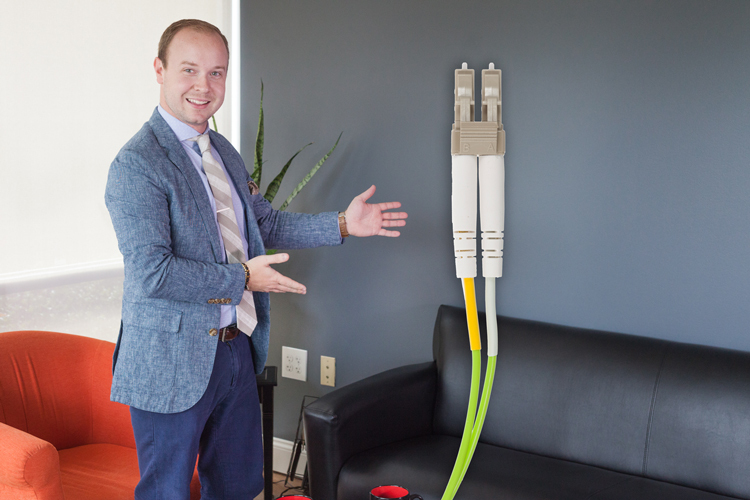 Today we caught up with the brightly dressed fiber cable, OM5 for an amazing interview. We had the opportunity to take a deeper look into what makes OM5 who he is, and how he is related to the other fiber cables. You’ve started a project to upgrade your network but not sure of what fiber cables you need. Should the cables be single-mode or multi-mode? Is there a specific length or speed needed? All of these questions are great to ask as you prepare your network project and think of future upgrades. Here is everything you need to know about fiber cables including the newest fiber type, OM5. What is an SFP and How is it Used? Mayday, mayday. We have a problem! We have two switches who desperately want to talk to each other but the walls of their switch cabinets are restricting conversation and they are located 7 feet away from each other. Luckily there is a transceiver that can help us out: the small form-factor pluggable. [Read more…] about What is an SFP and How is it Used? Does the Name Brand Really Matter? Any Costco fans out there? I certainly am…for some things. I am also the first to admit that it took most of my entire lifetime to arrive at that point. There was just some unfounded stigma about using an item that wasn’t a name brand. Not to mention, I didn’t want my guests to see anything in my cabinets like that. [Read more…] about Does the Name Brand Really Matter?